The first two films in the 'Race' franchise were directed by Abbas-Mustan and the third is being helmed by Remo D’ Souza. While 'Race' starred Saif Ali Khan, Akshaye Khanna, Katrina Kaif and Sameera Reddy, the second part of the franchise saw John Abraham, Jacqueline Fernandez and Deepika Padukone along with Saif. Anil Kapoor and Saif Ali Khan starred in both Race films, with Anil being the only one to star in all three parts of the franchise. Jacqueline, who was seen in 'Race 2', will once again be seen opposite Salman in 'Race 3'. Well, having amped up the excitement levels already, it will be interesting to watch what the film has to offer once it hits the screens on June 15. Salman Khan released another poster of his upcoming movie Race 3 on Instagram and he couldn't have done it with more swag. The 52-year-old actor informed his fans about the release date of the trailer and also explained why the team is sharing several posters. He wrote: "Sach Batau, we were not ready with the Race 3 trailer.Is liye itne posters banaye.But Intezar ka fal meetha hota hai. The Race 3 trailer will be coming to you on May 15 and I promise you the wait will be worth it." But the Internet is happy and Instagram users showered their love for the film with likes and comments on the post. The latest poster of has over 3 lakh likes and comments such as "Can't wait," were posted by many users. "If the posters are so amazing, can imagine how the trailer is going to be," one comment read. 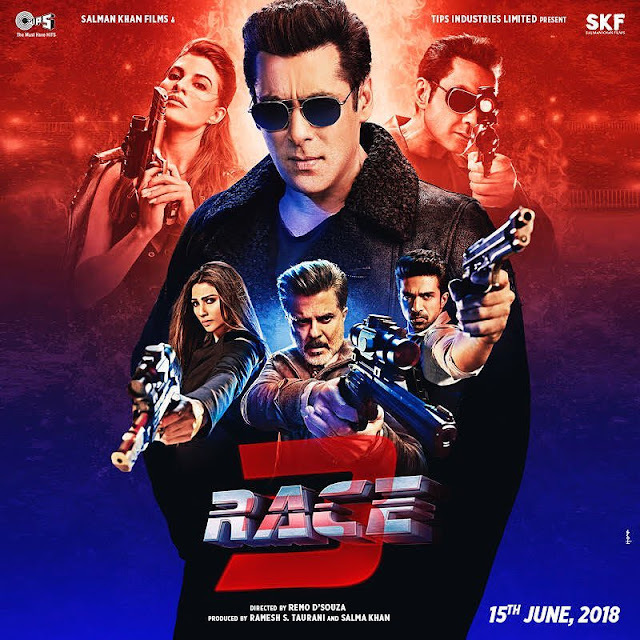 Salman Khan who plays the lead role in Race 3 is seen wearing a black jacket and aviators in the poster. The third installment of the Race series will also have an ensemble cast like the other two. While Jacqueline and Anil Kapoor remain constant from Race 2, Bobby Deol, Daisy Shah and Saqib Saleem are the latest additions to the movie. Unlike the former parts, this time the movie will be directed by Remo D'Souza instead of Abbas-Mastan. Race 3 will release on Eid this year. Most of Salman Khan's movies including Bodyguard, Kick and Ek Tha Tiger released on Eid and Race 3 will follow suit. Salman Khan and Jacqueline Fernandez are currently shooting for a romantic song in Kashmir. Today Jacqueline took to Instagram and shared a candid picture with Salman Khan from the sets. In the picture, Jacqueline is seen covered in layers of blanket and sipping a hot drink. While on the other hand Salman Khan is seen looking somewhere else and is seen wearing a vest. Jacqueline captioned the photo as "Too hot to handle @beingsalmankhan #race3 #kashmir @remodsouza @skfilmsofficial @tips" Reports have it that Salman along with the 'Race 3' team will shoot for two-three days in Srinagar. Post the Kashmir shoot, they will head to Leh, Ladakh for a song shoot. Directed by Remo D'Souza the action flick also stars Jacqueline Fernandez, Bobby Deol, Saqib Saleem, Anil Kapoor and Daisy Shah. 'Race 3' is all set for an Eid release on June 15, 2018. After 'Race 3' Salman Khan will begin shooting for 'Bharat' opposite Priyanka Chopra. The film will be directed by Ali Abbas Zafar and it is an official adaptation of a South Korean film titled 'Ode To My Father'. 'Bharat' will hit the screens on Eid 2019. Salman Khan and Jacqueline Fernandez, the stars of the upcoming actioner ‘Race 3’, packed their bags and headed to hills of Jammu and Kashmir to shoot a sequence for their film. The two stars created quite the fan-frenzy in Sonamarg when they were spotted arriving in off-road vehicles. Sonamarg has been one of the favourite shooting locales for Bollywood filmmakers. Salman is shooting for the second time here, after Kabir Khan's 'Bajrangi Bhaijaan'. Dressed in winter-wear, Khan was seen driving his vehicle to the set location where he met and greeted a few lucky fans apart from also posing for pictures. Co-star Jacqueline was also seen sporting a beige coat and wearing her hair in loose curls. The pair is expected to complete a two-day shooting schedule before Salman likely heads Ladakh to continue filming. 'Race 3' will also feature Anil Kapoor, Bobby Deol, Daisy Shah and Saqib Saleem and is scheduled to release on Eid, June 15, 2018. Salman Khan on Monday reached the picturesque Sonamarg hill station in Jammu and Kashmir for a two-day shooting schedule of Remo D'Souza's 'Race 3'. He is likely to shoot for the movie in Ladakh after completing the schedule in Sonamarg. Sonamarg has been one of the most favourite shooting locales for Bollywood and it is hosting Salman for the second time. He spent over a fortnight in Sonamarg last time shooting for Kabir Khan's super-hit movie 'Bajrangi Bhaijaan'. Raj Kapoor's 'Ram Teri Ganga Maili' and Yash Chopra's 'Silsila' are some of the better known Bollywood movies shot in Sonamarg. Besides Salman, 'Race 3' will also feature Anil Kapoor, Bobby Deol, Jacqueline Fernandez, Daisy Shah and Saqib Saleem. Like all Salman blockbusters, 'Race 3' is scheduled to be released coinciding with Eid on June 15. Actor Jacqueline Fernandez, who is starring in a Remo D’Souza film titled ‘Race 3’, took a moment to appreciate the director-choreographer for doing a fantastic job with the film. ‘Race 3’ is a third installment of the popular action-thriller franchise ‘Race’. In a recent media interaction, the ‘Judwaa 2’ spoke about her association with Remo’s movies and more. Jacqueline, who is collaborating with Remo for the second time, said in a statement, "It was an amazing experience. We had gone to some great location and shot some really cool stuff. Remo, I feel is doing a fantastic job. The cast is already excited so we all are having real fun." The actor further added, “I am very excited. We all worked really hard in the film and it's turning out to be amazing.” ‘Race 3’ is produced under Tips Films and also features Salman Khan, Anil Kapoor, Bobby Deol, Daisy Shah and Saqib Saleem in pivotal roles. The film is slated to hit the screens on June 15 and is yet another Salman’s release on Eid. Salman Khan's upcoming film 'Race 3' is one of the most anticipated films of this year. The makers are currently shooting for the last few portions of the film. Recent reports have it that Salman Khan and the 'Race 3' team will reportedly shoot for two to three days in Srinagar. Reports also suggest that the team will shoot for a couple of scenes and a few portions of the 'Allah Duhai Hai' song in Kashmir. Post the Kashmir shoot, they will head to Leh, Ladakh for a song shoot. Salman Khan had last shot in Jammu and Kashmir for 'Bajrangi Bhaijaan'. Directed by Remo D'Souza the action flick also stars Jacqueline Fernandez, Bobby Deol, Saqib Saleem, Anil Kapoor and Daisy Shah. 'Race 3' is all set for an Eid release on June 15, 2018. On the other hand, Salman Khan is also lined up with 'Bharat' opposite Priyanka Chopra. The film will be directed by Ali Abbas Zafar and it is an official adaptation of a South Korean film titled 'Ode To My Father'. Produced by Salman’s brother-in-law Atul Agnihotri, 'Bharat' will hit the screens on Eid 2019.